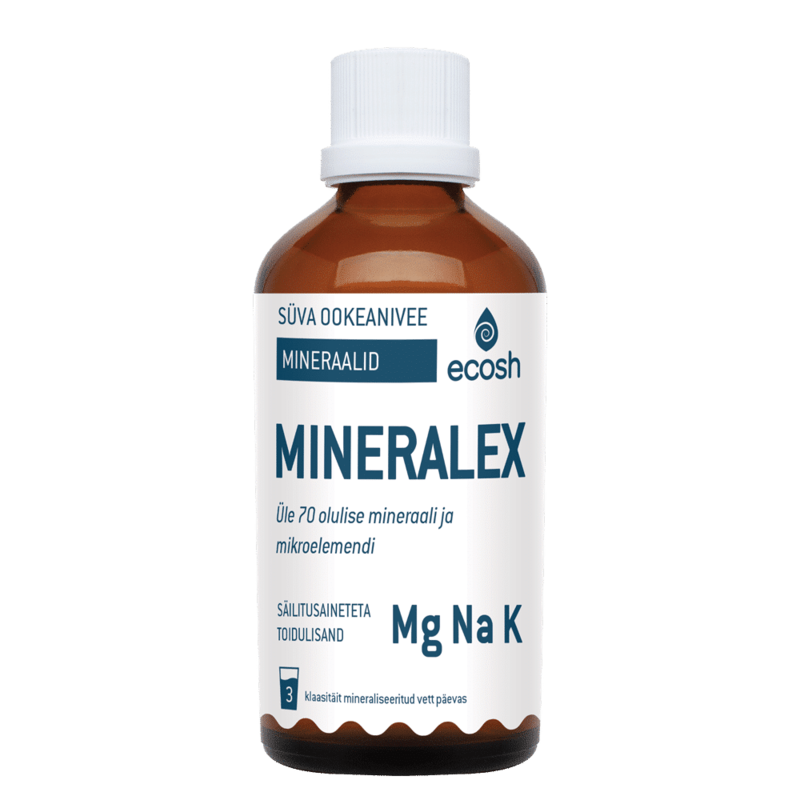 Sea water in the MINERALEX product naturally contains more than 70 minerals and trace elements, with the highest concentration of magnesium, sodium, and potassium. These minerals that are highly absorbent and easily taken up by the body help to keep the body alkaline, provide a structure for organs, tissues, and bones, and make up body fluids and enzymes. The importance of minerals for our body can be compared with gemstones. Thanks to these, biological functions take place in the body, and even alternative or classical medicine cannot perform or replace these. Minerals are the building blocks of our body and are important in the skeleton, body fluids, and enzymes. Without minerals, the body can not function. Macro and microelements provide a structure for organs, tissues and bones, maintain cell membrane permeability, and help keep body fluids and tissues alkaline. 25 minerals are required for the body to function normally, of these seven are the main macro elements – potassium, calcium, sodium, magnesium, sulphur, chlorine, and phosphorus. The organism requires these minerals in large quantities, more than 0.1 g per day. The trace elements are need in smaller quantities in the body, only in milligrams or micrograms. Some of them – iodine, copper, zinc, chromium, selenium, manganese, and silicon are included in the list of vital microelements. MINERALEX contains 100% pure, natural, deep-ocean minerals that are concentrated and have undergone a series of different filtrations and quality controls. No chemicals or other additives have been added to the mineral concentrate. The production plant that mines for ocean water minerals is proud of its quality control and of the results that have been verified by various research studies. Sea water contained in the MINERALEX product naturally includes more than 70 minerals and trace elements such as magnesium, sodium, potassium, calcium, chlorine, iodine, boron, iron, zinc, selenium, copper, molybdenum, manganese, chromium, sulphur and many other essential minerals and micro and macro elements that are important for the functioning of the body. These natural deep-sea minerals and trace elements are highly bioavailable and easily absorbed by the body. Elderly – strong bones, healthy heart, energy and mental well-being. Middle-aged – good cholesterol level (high cholesterol level is an indicator of inflammation and stress) and healthy circulatory system. Teenagers – to support an active lifestyle – strong cardiac muscles, bones and undisturbed blood pumping throughout the whole body. Recommended administration: Add half a teaspoon of the concentrate to a 300 ml glass of water (or some other preferred drink). Use 3 glasses of mineralised water daily. Warning: A dietary supplement does not replace a diverse and balanced diet and a healthy lifestyle. Talk to your doctor or therapist if you are pregnant, breast-feeding, or take medications. Keep out of the reach of children. Product Quantity: 100 ml, concentrated minerals, liquid. NB! Studies show that the absorption rate of liquids is 6 times higher than that of tablets and capsules.